Quarry Tile is one color of hard fired clay "through the body". It is not glazed and has a low (approx. 5%) absorption rate. Some are "flashed". This is a process in the kiln that results in variegated color. Surface finishes vary from soft/smooth to the slightly grainy finishes. Grit and raised rib finishes provide greater traction.
. High fired and very tough and durable. Many color, pattern, and texture options.
. With an approximately 5% absorption rate, yes Quarry Tile needs to be sealed. And, of course, the grout needs sealing.
. When slip resistance is a concern, Quarry Tile is available with many different traction finishes from grit to lugs.
. 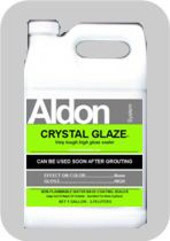 Even for non-traction tile, use Aldon "Grout Easy" to keep grout from leaving smears from the grout installation and creating a more difficult cleaning problem than necessary. Do not use a sealer (pre-seal) for this purpose. #2. If the Quarry tile is grouted, but grout is not sealed. #3. If the Quarry tile has been sealed in the past. "Same Day Sealer" on Quarry Tile. This sealer is Water Base | Penetrating Type. Provides: No color enhancement or gloss. Coverage guidelines (depending on absorption) 250 to 600 sq.ft./gal. 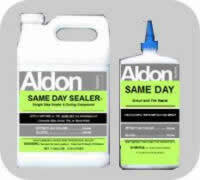 "Same Day Sealer" is recommended when sealing only the grout. It wipes easily from the tile face to make the process easier. 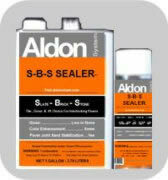 "S-B-S Sealer" on Quarry Tile. This sealer is | Solvent Base | Penetrating Type. Provides: color enhancement | low gloss | strengthening | efflorescence barrier. Coverage guidelines (depending on absorption) 150 to 500 sq.ft./gal. S-B-S Sealer is a low solids sealer that is perfect for Quarry tile projects. In addition to sealing and protecting, it creates some color enhancement and an easier to clean surface. Top part is unsealed (raw). Bottom 2/3 is sealed in 1 application creates a matte gloss level. There is some color enhancement. "Crystal Glaze Sealer" on Quarry Tile. This sealer is | Water Based | Coating Type. Provides: little or no color enhancement and high gloss. Coverage guidelines (depending on absorption) 350 to 600 sq.ft./gal. Top part is "raw" unsealed. Bottom part is one application of Crystal Glaze. Easy Care Products: for a Quarry floor or wall. "Maintain" - for no streak wet mopping of Quarry and all other types of flooring. You may have heard of concerns about Quarry Tile. All of them would be prevented with the information we provide here. Therefore, you can have the floor you want!